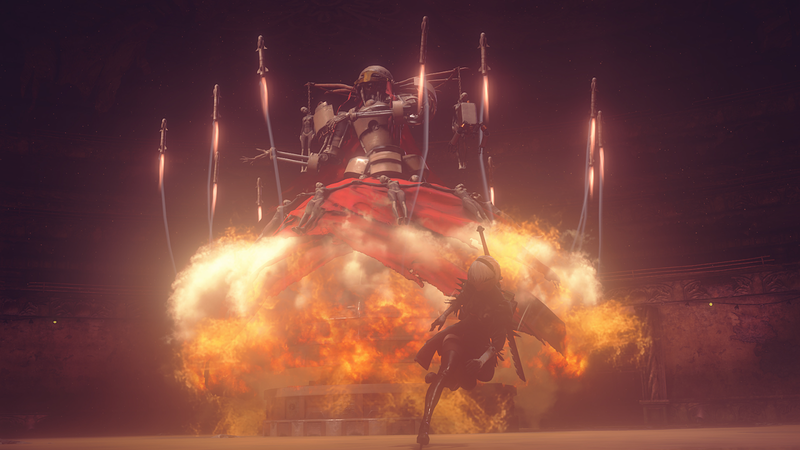 Nier: Automata’s existential story about an endless war between androids and machines has a ton of great moments. My favorite moment of all doesn’t come from an epic sword duel on top of a tower or a difficult, fourth wall-breaking decision, but instead from a perfect musical cue. Early in the game, protagonists 2B and 9S stumble across an amusement park full of playful robots on parade. Androids and “machines” have been at war for centuries, and up until this point in the game, all encounters with machines have been hostile. The amusement park is the first time where the machines are passive—it’s up to the player whether to initiate combat. However, while the amusement park seems joyous, its heart hides a dangerous enemy: a massive opera-singing robot named Simone. As a boss battle against Simone starts, a boss theme called “A Beautiful Song” starts to play. It starts with a lone voice singing over frantic drumming. As her singing reaches crescendo, Simone charges up a series of laser beams that will shoot across the floor. The energy builds, the signing grows stronger, and when she fires the attack, a chorus of singers joins in the accompanying track. The result is a gorgeous piece of choreography. Every time I play through the boss fight I get chills. This week, I started playing Nier: Automata on Kotaku’s Twitch channel, here’s my reaction when I reach this moment. Even on my third playthrough, I freak out. Small touches like this take advantage of how much video game designers can control what happens in a game to help make Nier: Automata great. This musical cue lines up the game’s action with its music to create a memorable moment that stands out.